Relatives: Son of John Trudgett Baker (deceased) and Mary Ann Baker. Address: 113 George St, Hadleigh, Suffolk. 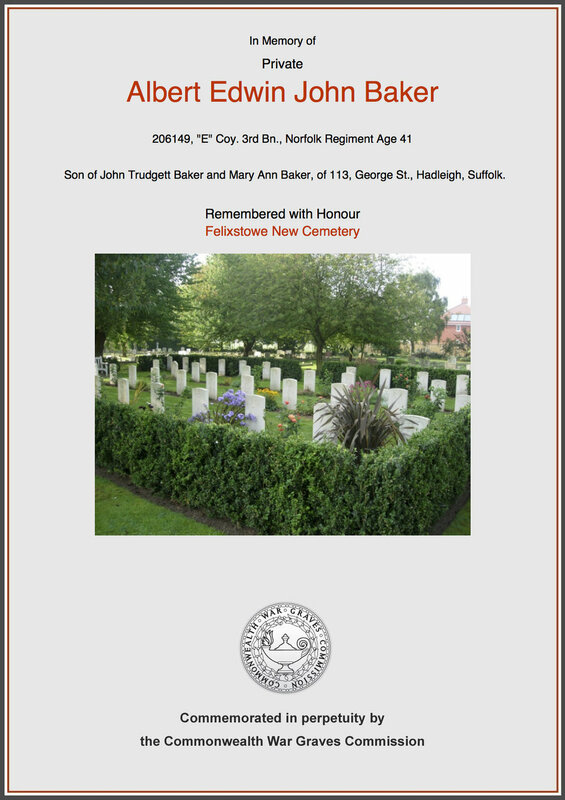 Albert Edwin John Baker was a Private in the Norfolk Regiment when he died on 8 July 1918. However, his name does not appear on the Hadleigh war memorial. The very sad circumstances of his death possibly offer a clue as to why his name was omitted. Albert was born in 1877 and on leaving school he worked as a butcher’s boy. His father had died in 1890 when Arthur was just thirteen. He seemed to have been a rather fragile character with a nervous disposition, living with his mother for much of the time. But when she moved into the alms houses on George Street, Albert was out of work and taken into the workhouse at Semer. We know he was an inmate there in 1911. During the war years he enlisted into the Army, probably by conscription. He was in his late thirties, single and was sent to join the Royal Defence Corps who were used for home service duties and we know that Albert spent time guarding German prisoners in Northamptonshire. 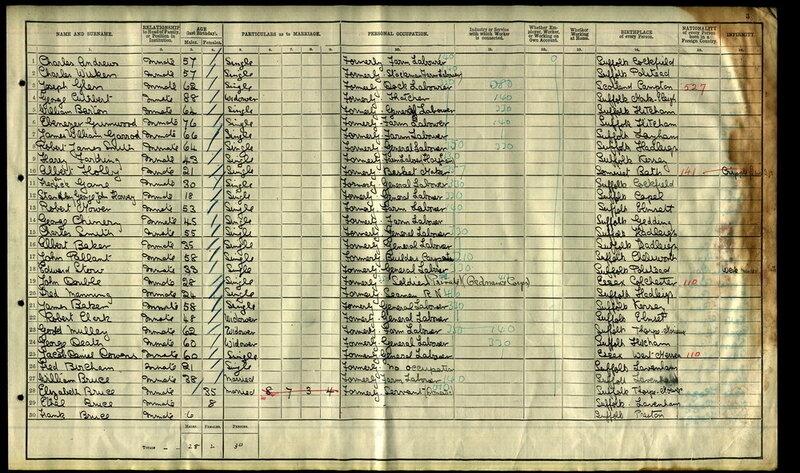 In mid 1918 with an urgent need for more troops on the Western Front, Albert's fitness was re-categorised as B1 and he was transferred to the Norfolk regiment at Felixstowe, where he would be made ready to deploy overseas. Shortly before arriving in Felixstowe, Albert spent some leave at home in Hadleigh and during this time he paid a visit to Mr Harris, the Bridge St Boys School headmaster, who maintained a close relationship with all the old boys. (Many of the old boys corresponded with Mr Harris and he in turn wrote short updates in the local newspaper). 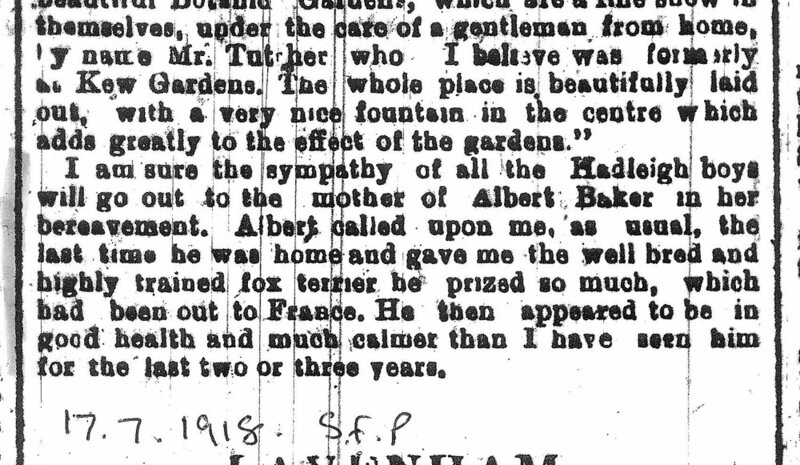 During the visit, Albert gave his well bred and highly trained fox terrier to Mr Harris and Mr Harris reported that Albert appeared to be in good health and was much calmer than he had been for years. This suggests that Albert would normally be more stressed. 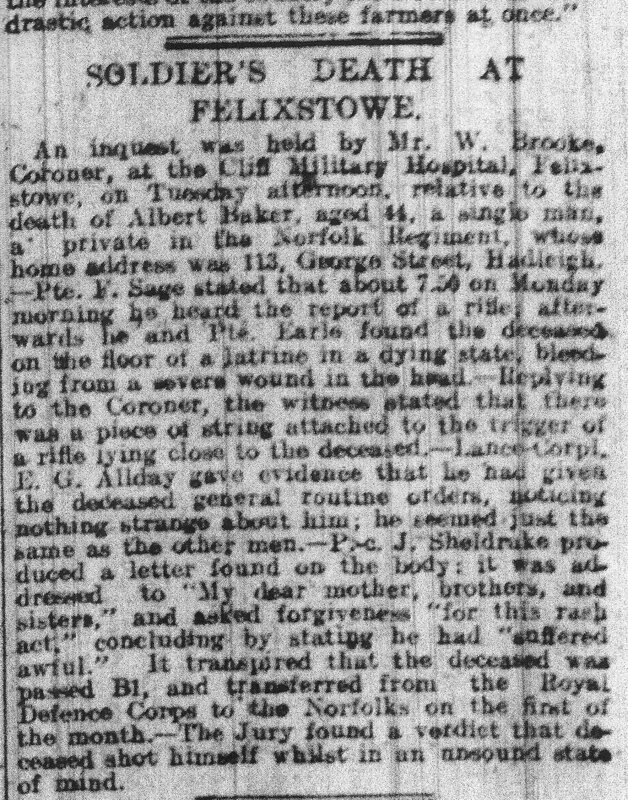 He joined the Norfolk Regiment at Felixstowe at the beginning of July he was probably being made ready to deploy overseas, a prospect that must have terrified him. On a Monday morning after receiving General Routine Orders from his NCO, he went into a latrine and took his own life with a self inflicted gunshot wound to the head. It is unclear why, but the prospect of front line service must have terrified him. Details of the death were revealed during a coroner’s inquest and reported in the newspaper. Albert left a note for his mother, brothers and sisters asking for forgiveness for ‘this rash act’. He was buried at Felixstowe New Cemetery. 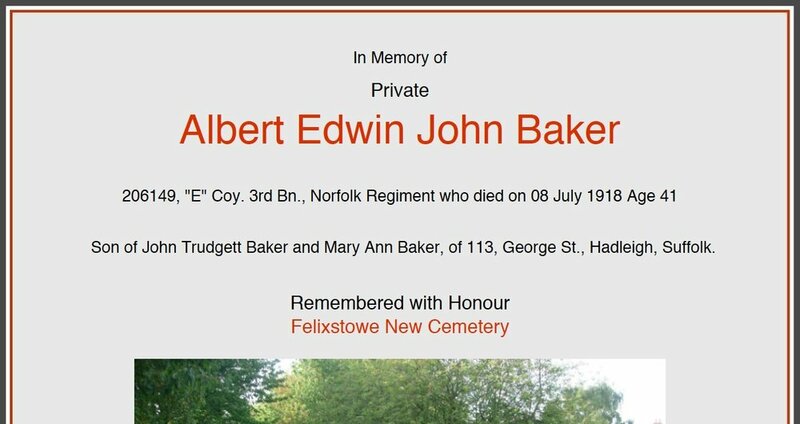 When the war was over and the Hadleigh war memorial was under construction, the ‘war memorial naming committee’ whose job it had been to compile the list of the names to be included on the memorial decided not to include Albert Edwin Baker. Perhaps the circumstances of his death influenced them. He has a Commonwealth War Graves Commission grave at New Cemetery Felixstowe and while the Hadleigh War Memorial naming committee made a positive decision not to include him on the memorial in his home town, his mother made sure to add the following poignant words to his headstone; “A GOOD SON TO HIS MOTHER”. 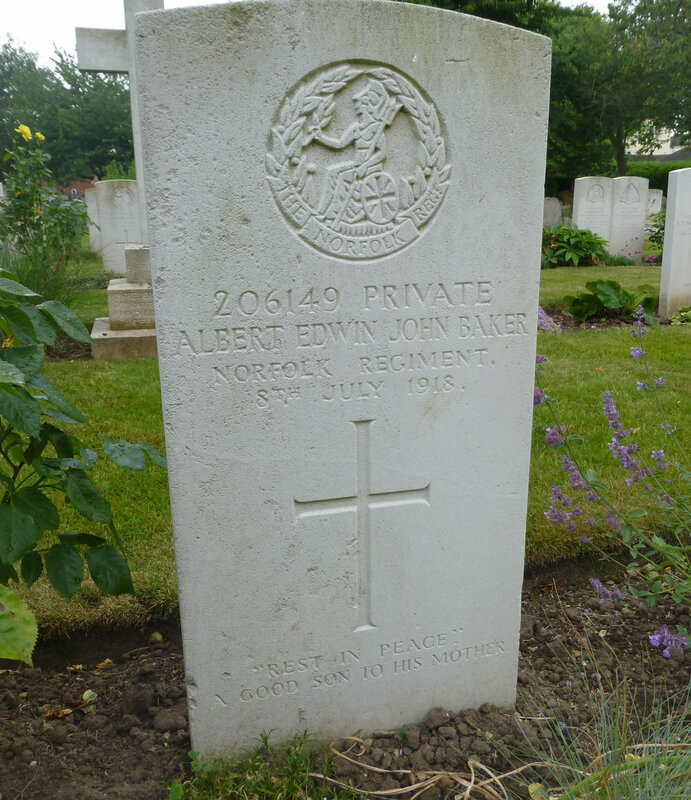 We hope that this page has been able to tell the story of Albert Edwin John Baker. If you know of any information which might help to add to the story then please get in touch.